What Can You Do With a 620 Credit Score? Questions about credit scores are the most common I get from readers and the 620 credit score seems to be the one where most people get stuck. It’s not quite really bad credit but still not good enough to get approved for loans at a rate people can afford. That’s why I created this series of posts on different credit scores and your options with each. Credit scores range from 350 to 850 but the vast majority of Americans are somewhere between 450 and 800 FICO. Let’s look at that 620 FICO range, what it means for your credit and what you can do to increase your score to get the money you need. How Many Americans Have a 620 Credit Score? 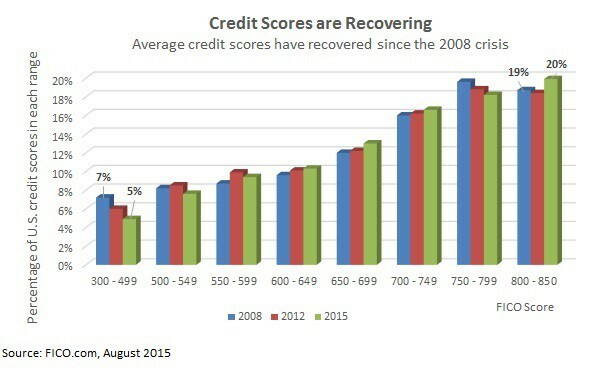 FICO scores have rebounded since the Great Recession but most Americans are still locked out of the financial system because of a bad credit score. More than one-in-four Americans (26%) have a 620 credit score or lower. The stats are even worse for younger borrowers where the average FICO score is 630 for those 18-29 years old. That means more than half the younger population is struggling with low credit. How Many People Have a 620 Credit Score? We talk about credit scores a lot but there’s really one score you want to be watching and that’s around 660 FICO. That’s the cutoff between prime and sub-prime lending, the cutoff for a lot of banks when deciding on loans. A 620 credit score is well below sub-prime and you’ll be locked out of a lot of loan types but the important thing to remember is that a lot of people are in the same situation and there are options available. Is a 620 Credit Score Bad Credit? This is the most common question I get for any credit score, “Is it considered bad credit?” I have to assume that the definition of ‘bad credit’ is that you can’t get the money you need at an interest rate you can afford. The short answer is, yes – a 620 credit score is bad credit…technically. That’s because it’s under the cutoff for what most banks or credit unions will accept on a loan application. When you are approved for a loan, it’s going to be for very high interest rates and payments you might not be able to afford. 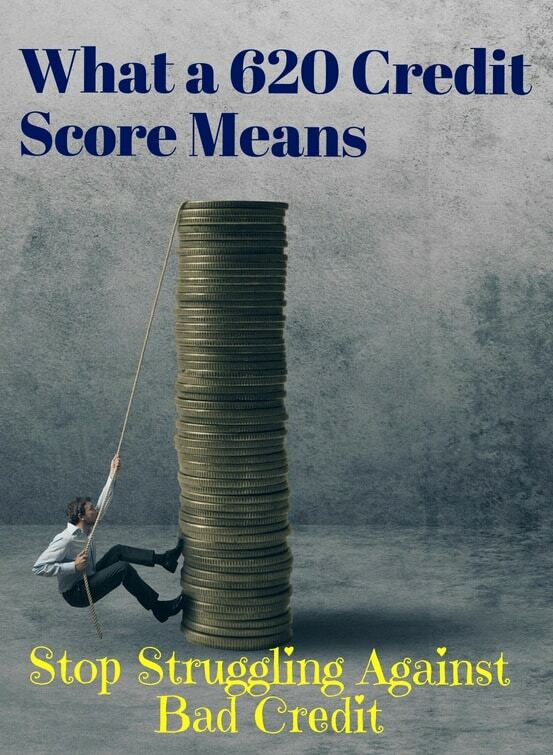 But instead of thinking in terms of bad or good credit, try thinking about it in terms of score ranges. A 620 credit score is in the range of ‘Fair’ in the graphic below, not as bad as the many people with a sub-600 credit score but still some room for improvement to get better rates. Your goal here, and this is something we’ll work on later in the article, is to get your score into that next range above a 650 or 670 FICO. That’s going to open up a world of opportunities for loans and financial tools. What are Your Loan Options with a 620 Credit Score? The sad truth here is that a 620 credit score will lock you out of a loan from any traditional bank or credit union. That’s OK because there are other loan options and if you did get approved for a loan from either of these two, with a score that low, the interest rate would be sky-high. Thinking about your loan options, the first thing to do is to understand why you need the money and whether a loan can help your credit score. If you have a bunch of other loans or credit card balances that you’re unable to pay because of high interest rates, a debt consolidation loan might be a good start to getting everything on track. This is where you take out a personal loan to pay off your other debts, lower the interest rate and get a monthly payment you can afford. If you’re starting from some missed payments or other reasons why your FICO is so low, this is a good place to look. If you have bad credit simply because you don’t have much of a credit history and you only need a small loan for an emergency expense, then that’s another story. This is where many younger borrowers find themselves and a peer-to-peer loan can help build credit history to boost your score. For debt consolidation, I’ve used PersonalLoans.com after destroying my credit score in 2008. The company specializes in bad credit personal loans and you can use the money for anything. When I got my loan, I had a credit score of 560 so you can get approved even with low credit. Rates on any loan are going to be 20% or higher with a 620 credit score but there’s no prepayment penalty so you can pay it off early to save money. Loans are available up to five years so payments are affordable. I always recommend checking at least two websites for personal loans to make sure you get the best rate available. These sites run a soft-pull on your credit so it doesn’t lower your score. You’ll be able to see your rate and payment before accepting the loan. NetCredit is another site that specializes in bad credit loans in the 600 credit score range. The site doesn’t quite have the range compared to the personal loans platform, there are a few states where loans are not made, but it’s a good second-choice. If it’s because you just don’t have much of a credit history, then your best bet is to get a credit card or a personal loan to start building that credit. You’ll have monthly payments that will go on your credit report and it will only take between one- to two-years to boost your score into the 700s. Understand that you shouldn’t borrow money simply to build credit and have those monthly payments. Use your credit card only for things you can pay off at the end of the month and don’t use it as an excuse to run out shopping. If your credit score is low because of mistakes and bad marks on your credit report, then it’s time to start cleaning up your report to boost your score. It will usually take between three- to six-months to start seeing an increase in your credit score but much longer to get it into the ‘good credit’ range. A lot of those missed payments and bad marks on your report will stay on there for three- to five-years and hold back your score. Unless you can get them removed, there’s nothing to do but wait. By adding good payment history on your report through a consolidation loan or other payments, you should still be able to boost your FICO into good credit within a couple of years. Then you can refinance your bad credit debt with lower rates and easier payments. Having a 620 credit score is not the end of the world. Believe me, I’ve seen worse and have lived through worse. It’s not fair that your financial life is determined by a little three-digit number but that’s how things work. Understanding why you have bad credit helps up attack it and increase your score to open up more financial opportunities.